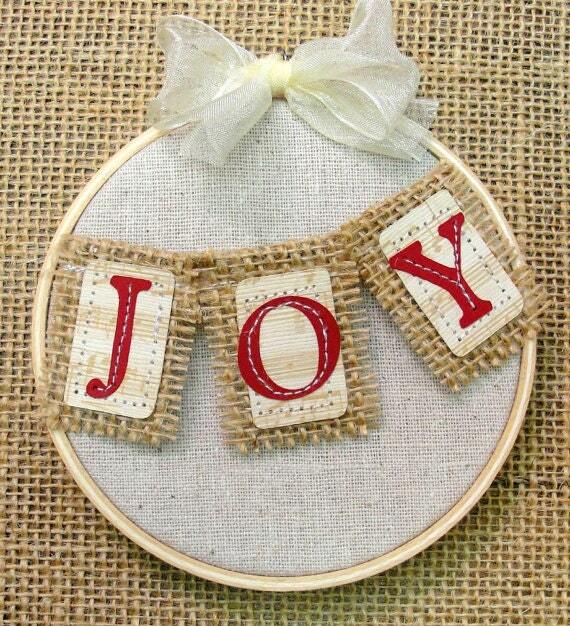 This month we are decking the halls with embroidery hoops! This is such an easy project, I feel like I’m cheating! 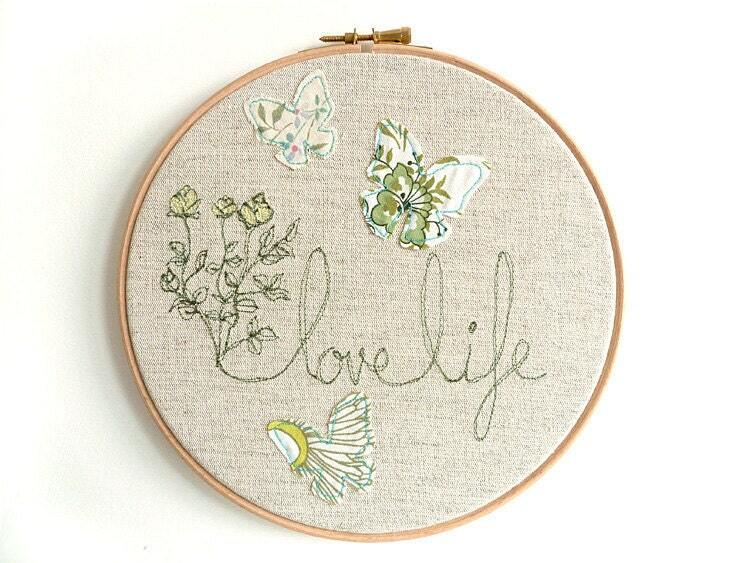 You can embellish these embroidery hoops as little or as much as you want. I’m using Winter’s Lane fabric from Moda (via The Christmas Cloth Store at the Fat Quarter Shop) which is so pretty and perfect for this. Add some buttons, ribbon and ric rak and you’re all set! I recently received a few vintage embroidery hoops, plus I supplemented with a few that I bought at Joann’s in a 8″ size. I was looking for the smaller (3″ or 4″) sizes to use for ornaments, but I couldn’t find them anywhere. So I’m sticking with the larger sizes which are perfect to hang on the wall. I cut my fabric into squares that were about 1″ – 2″ larger than the hoop size. Then I centered the fabric over the inner ring and placed the outer ring on top. Once I was satisfied, I tightened the screw and then trimmed the fabric on the back side. I need to confess: I am not an embroidery expert. I don’t know if trimming the fabric is the correct way to do this. Maybe you should leave the extra fabric and sew a running stitch around it to gather the fabric from behind. If you know of a better way, please let me know! 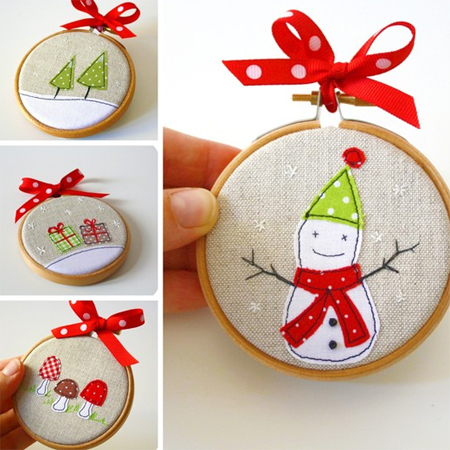 The Crafty Cupboard has some adorable embroidery hoop ornaments that had me at ric rak! If you don’t have any embroidery hoops in your stash, I give you permission to go shopping! And of course you’ll have to get some pretty fabric to go with it ;-). I am so excited to make it this year. 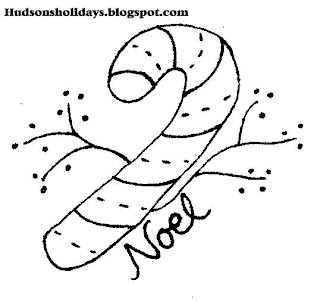 Great post, I liked your embroidery hoop ideas. Excellent Blog related to Embroidery and Embroidery Machines I think very useful for all people. Keep up the great posts! These are SO cute! 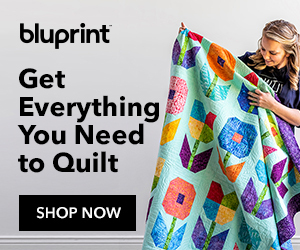 And I’m dying over your fabric…love it! Just recently discovered the magic of using embroidery hoops as frames. And yours are calling me to action! Now, finally i know exactly what to do with an adorable Matryoshka fabric I ordered from Spoonflower. Regarding you question on trimming fabric at the back of the embroidery hoop: I think that works okay, however, if the fabric gets loose in the hoop it’s almost impossible to get it re-hooped as well as you did before the trimming. I like to use a lightweight fusible fleece on the back of the fabric because it holds everything tight much better and produces a nice, smooth appearance to the front picture area. I usually trim if I’ve used the batting. I suppose you could also do a trim at about an inch away from the hoop and then use a running stitch to hold the fabric to the back/center of the hoop. Love your designs & hoops! Thank you for the great input Peggy! I had thought of lining the fabric with something, but I didn’t know what exactly. Fusible fleece sounds perfect! Oh. I am soooooooo making these! That new fabric line is just irresistible! Awesome post, Julie!